VICTORIA, BC – Phillips Brewing has announced the return of an annual ale that celebrates the best of BC’s local hops harvest. 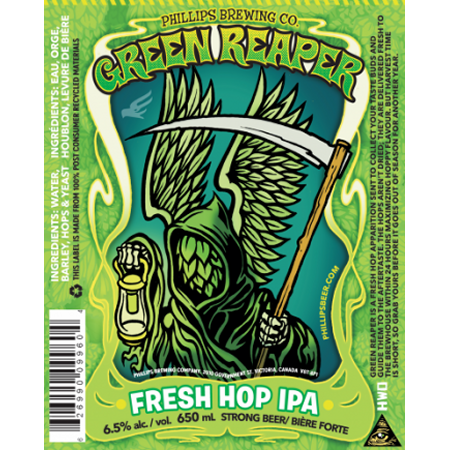 This year’s Reaper is packed with fresh cascade hops which were shipped straight from the farm and into our brew kettle. Grapefruit aroma and flavours are underpinned with slight floral hints. This IPA remains subtly sweet, featuring a vibrancy and delicacy that can only come from full-cone, never-dried hops. Grim Reaper is available now in 650 ml bottles at select private liquor retailers in BC and at the Phillips retail store while supplies last. A tasting event featuring free samples of Grim Reaper on draught will take place at the brewery on Thursday October 23rd from 4:00 to 6:00 PM.